Secretary-General António Guterres speaks to journalists at a press encounter. The UN Secretary-General said on Saturday he was “deeply shocked” by a deadly mass-shooting inside a synagogue in the US city of Pittsburgh, which reportedly left 11 people dead and several others wounded, some critically. In a statement issued by his Spokesman, António Guterres said that the horrific attack, which took place inside the synagogue while it was packed with worshippers, was a “painful reminder of continuing anti-Semitism”. Police were called to the Tree of Life synagogue in the largely-Jewish neighbourhood of Squirrel Hill in the western Pennsylvania city, during morning services marking the Sabbath. A heavily-armed gunman opened fire and according to US media reports, shouted, “All Jews must die”. The gunman was later taken into custody by police, after barricading himself into a room, and eventually surrendering after reportedly being shot. Several police officers were among the wounded, and reports say there were no children among the casualties. Initial reports say that the gunman’s social media posts were rife with anti-Semitic comments. The shootings are now under intense investigation at a Federal level, as it is being treated as a hate crime. In his statement, Mr. Guterres expressed his deepest condolences to the families of the victims. “Jews across the world continue to be attacked for no other reason than their identity. Anti-Semitism is a menace to democratic values and peace, and should have no place in the 21st century,” he added. 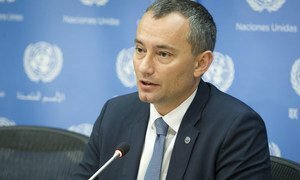 The United Nations’ top official for the Middle East Peace Process has said that spreading “deeply disturbing” conspiracy theories which fuel anti-Semitism are unacceptable, and serve neither the interests of Palestinians themselves, or the pursuit of peace in the region. 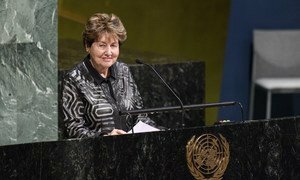 More than seven decades after the end of the Holocaust, Eva Lavi – the youngest living Holocaust survivor saved by German industrialist Oskar Schindler – still feels guilty that she survived when so many of the Jewish children her age at that time were killed, including her cousins.